In a freak accident, police scientist Barry Allen is struck by lightning and doused in chemicals. Barry discovers that this accident has made him the fastest man alive, able to move at nearly the speed of sound. With the help of STAR Labs scientist Tina McGee, he learns to control his powers...but when his older brother Jay (a motorcycle cop) is killed in the line of duty, Barry asks Tina o make him a special costume that can withstand the rigors of hyperspeed travel. He sets forth to clean up the streets of Central City as The Flash. 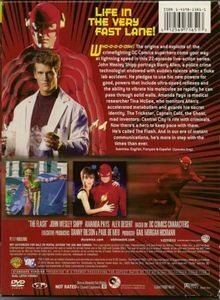 Barry Allen, a police scientist, is working one night during a terrible thunder storm when a bolt of lightning crashes through the lab window, electrocuting him. Barry survives and soon learns that he is now able to move at almost incomprehensible speed. Homeless people are dying and their bodies are disappearing. Tina rekindles a relationship with a former colleague who is an expert in genetic engineering. A corrupt D.A. 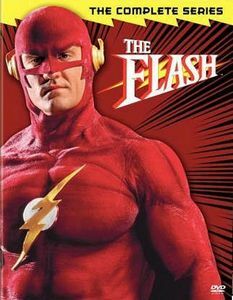 hires a private investigator to learn the Flash's secret identity and then try to blackmail him into working for the D.A. While arranging security at the Central City Museum, Barry is reunited with an old girlfriend and a former mentor. A mad scientist uses the Flash as a supernatural force. A murderer escapes from prison to find his loot and kill Barry's father, the cop who put him away. An orphan boy has information that incriminates a 1960s cult figure who is trying to make a comeback. Pieces of a broken madillion are the only clue to an unknown assassin who is on a deadly rampage in central city. Barry finds himself up against an unseen criminal who traps Tina and her boss in the lab. When Julio's old friend - a jazz musician accused of killing his wife years ago - is scheduled for execution, Barry and Julio race against the clock to prove his innocence. 1 hr 0 mins 2/7/1991 13. Tina, Is That You? Barry must protect his old girlfriend, Megan Lockhart, from an obsessed, maniacal criminal disguised as The Trickster. When Barry has nightmares about Tina betraying him, she puts them both under her scanner; but something goes terribly wrong. His dreams are transferred into her mind and now she thinks that she is a gang member. Barry must protecting a woman and her child from her Criminal ex-husband. Jay's killer, Nicholus Pike, is released from jail and blames the Flash for Jay's death. He sets the Flash up by using a heat seeking bomb on him, but something goes awry. Instead of killing the Flash, it sends him into the future where Pike is in charge and outlaws anyone from mentioning the Flash. The Flash and the Nightshade team up once again as they go up against a nightshade imposter. Captain Cold, who freezes his victims to death, is contracted to kill the Flash. A scientist clones Barry. The clone is physically perfect but emotionally it is still a child. Barry meets an old classmate and gets involved in a scheme to rip off Star Labs. When a ""presumed to be dead"" criminal's body disappears, Barry is suspected. The criminal has invented a machine that makes anyone who hears it's strange sound waves fall into a deep sleep. Barry and Tina befriend an Android who's running from a group of assassins wanting to use her as a deadly weapon. The Trickster escapes from his trial and brainwashes the Flash.